Sisters MaryAnn Bulawa, Adia Bulawa and Lillith Bulawa have developed a hydroponic garden designed to work in the microgravity of low Earth orbit. They are presently running a crowdfunding campaign to pay for the costs of sending the experiment to the International Space Station. We are Chicks in Space, a team of three sisters – MaryAnn Bulawa, Adia Bulawa and Lillith Bulawa – who are on a mission to help make future long term space missions possible. We have grown up working on NASA projects and challenges and in 2012 we participated in the Conrad Spirit of Innovation Challenge. This challenge encourages high school students to develop unique products that will benefit society. 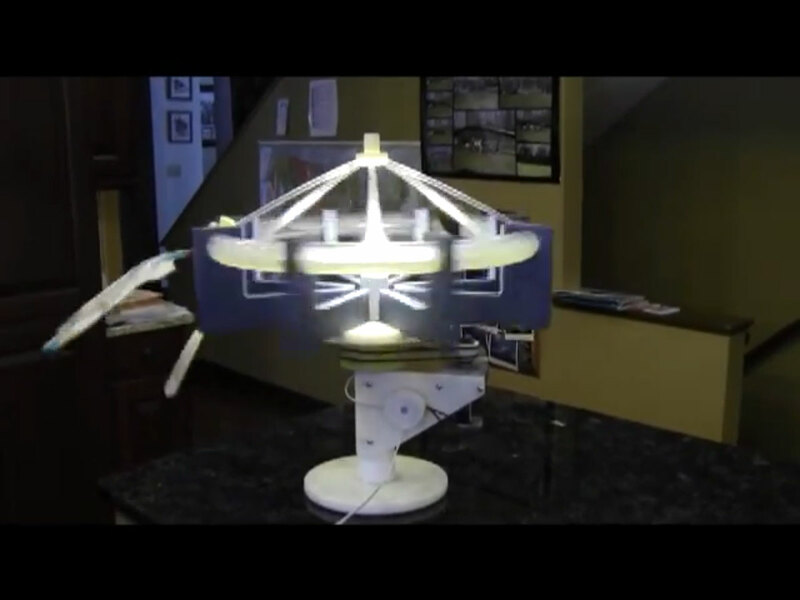 The spinning prototype of the ETON hydroponic garden. Our project, a hydroponic garden, was specifically designed to work under conditions of microgravity. A renewable food source is essential for any long term space mission to become a reality. We called this the Garden of ETON – or Extra Terrestrial Organic Nutrition. Our garden uses centripetal force to circulate water because traditional hydroponic gardens are gravity driven and would not function in conditions of microgravity. While at the Conrad Spirit of Innovation summit we were introduced to NanoRacks’ Dream Up program. This program is designed to help experiments like ours get the approval of NASA for transport to the International Space Station. We were offered the opportunity to launch a prototype of ETON on the International Space Station to test under actual conditions of microgravity. There were multiple constraints, however, the most challenging for us to overcome was that the prototype would have to be contained in a 4 x 4 x 4 inch cube. We are now proud to present NanoETON, and we’re using www.experiment.com to raise the $15,000 necessary to send NanoETON to the International Space Station. This experience has been amazing for us. We have learned so much, not only about microgravity and plant growth, but about launching a project and the paper work involved in having it approved and cleared by NASA. We have been able to host an AMA on reddit.com with Dr. Jeffery Manber the CEO of NanoRacks, LLC (bit.ly/ETONgarden). We are so grateful that 50 people from around the world have already donated $4500 in the crowdfunding campaign for our project. 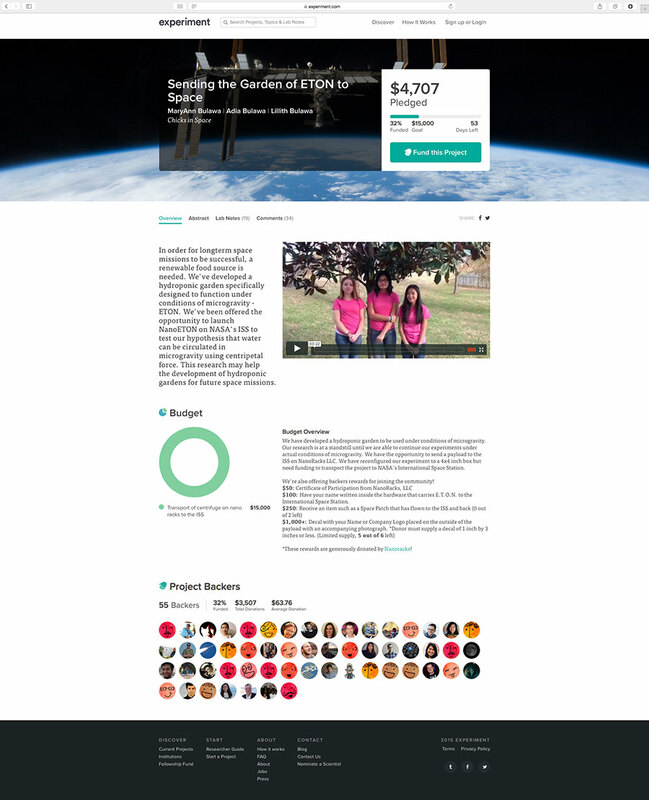 You can help the Bulawa sisters send their experiment to the space station by donating at https://experiment.com/projects/sending-the-garden-of-eton-to-space. NanoRacks operates the world’s first commercial laboratory in space, serving the education, basic research and commercial research communities. NanoRacks fully supports student-conducted experiments that use micro-gravity as a variable. In the past, students have mixed concrete, worked with ferromagnetic fluids, studied bone deterioration and one high school has even electroplated gold in space. Students can take advantage of standardized research platforms aboard the ISS inside the U.S. National Lab. Each NanoLab is plugged into the station’s power and communications system by a NASA astronaut for 30 days, offering students a dynamic chance to test scientific theories in the unique atmosphere of space. The four-inch NanoLabs can each house endless varieties of experiments utilizing microcontrollers, arduino-software controls, mixture tubes, plate readers, centrifuges, and more. In-flight data returns if needed for the project are also possible. Teachers, your students can design an experiment to be flown in space. Learn more at http://nanoracks.com/markets/educational/. 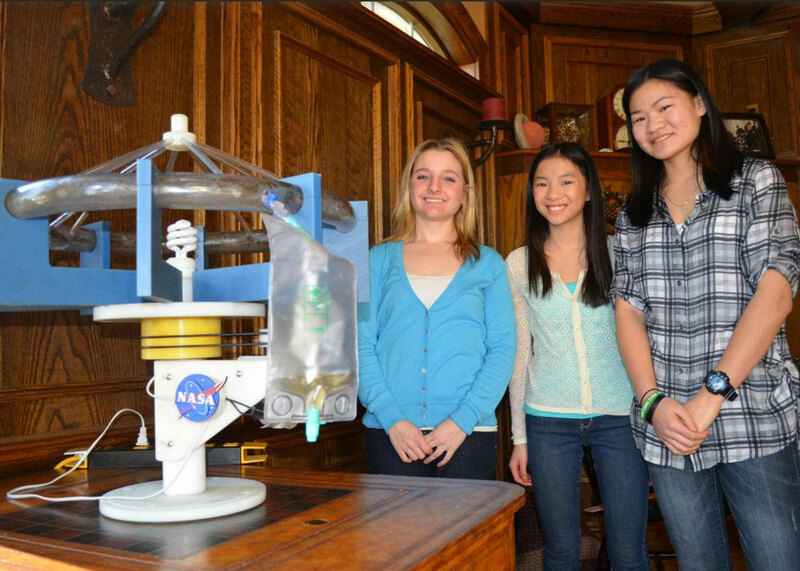 Chicks in Space is a group of high school girls dedicated to the advancement of space exploration. We have participated in multiple NASA challenges and have had experiments on a microgravity drop tower and a NASA weather balloon.